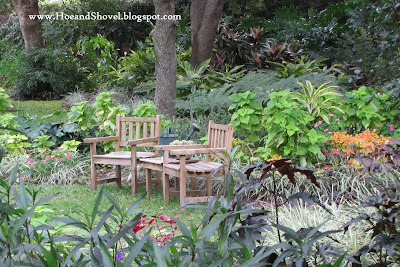 There is the big picture in a garden where a broad look speaks mostly of happily nurtured specimens and blissful Florida wintery days. Days where the sun shines brightly and plants require tending by the gardener even in the busiest of seasons. 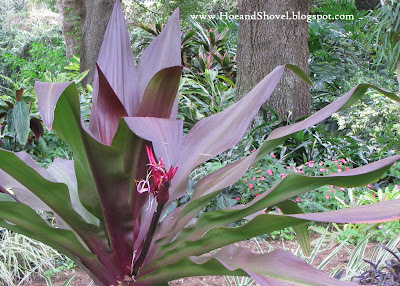 By the way, do you, dear reader, mind if I include a photo of the Giant Crinum Lily ~~this one in the back garden~~ in yet another post? To say it draws me in and requires my attention with its uber-long, broad, fleshy, magenta-hued foliage would be an understatement. AND it has turned darker in this location than when it was first planted ~~~ just as I'd dreamed. AND now that it keeps throwing out new spikes of fragrant blooms I love it even more ~~ if that is possible. Needless to say, it captures my attention whenever I'm in the garden ~~ I simply must take photos. There is the broader view... then there is the macro view which by chance tells a more detailed story when one takes a closer look at any garden. Hoe and Shovel happens to be home to some critters who do their damage in the nighttime hours. Nocturnal varmints who easily can tear up the roots of plants with their long claws and dig up bulbs by their curious habit of rooting around in the dirt with their long snout for grubs and worms. Mr. Meems has been determined to help me rid or at least reduce the population of armadillos here at Hoe and Shovel once and for all. So he moves the trap around daily and checks it each morning hoping one (or two perhaps) will walk into it while they scavenge through every planted bed and pathway following their noses and wreaking havoc. The day after Christmas a second one showed up in the trap. We rejoiced. It's easy to release them back into the woods a few miles north of our home but not near any other homes where they will be happy foraging and not causing damage. One more down... many more to go. While my camera was at the ready in the garden for the first time in a few days, there were a couple of other plants that caught my attention while I was out and about. 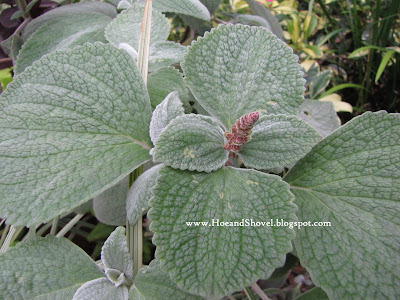 Plectranthus argentatus 'Silver Shield' has been particularly interesting this year. It has been happy since spring making it through our long, hot summer and into the cooler season. Which is only one of the attributes making it worthy to be added to the list of must-have accent plants. 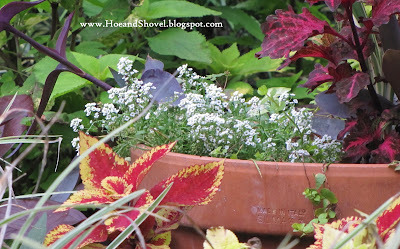 Rooting easily from cuttings it started out initially in container pots for a soft green contrast next to the deeply colored Pseuderanthemum 'Black Varnish'. The insignificant bloom is of little import. 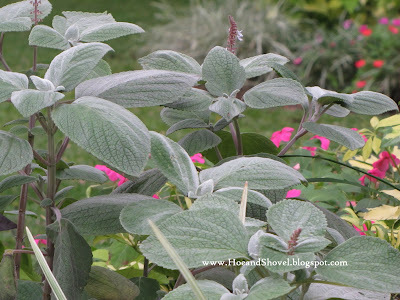 But its foliage, with an ever-so-slightly fuzzy nap of silver velvety-ness that adds a layer of even more texture and accentuates the darker veins, is what steals my heart. Because it has worked so hard for me in containers more of it was rooted and placed in the ground and is doing well there, too. It's always nice to know with plants we try out for the first time just how far they'll go for you. There aren't too many plants around here that transition through the stage of flowering prettily in one season and turning to seed-heads in another. The goldenrod has been left standing tall in replica of fuzzy weeds to remind us it really is winter in Florida. 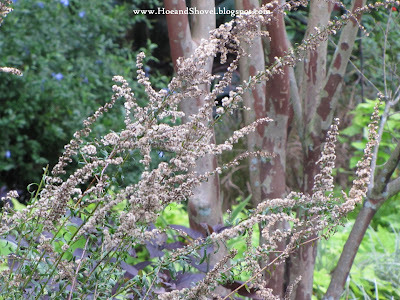 Gotta love the bark on the crepe myrtle in the background. The armadillo trap is set and moved about each day for repeated attempts at trapping the critters that love to challenge my patience. We don't know how many there are lurking about in the woodlands and conservation areas around us but we would be happy if we convinced ourselves we are reducing the population and the damage done to the garden. Here's hoping you are all enjoying the holidays and staying safe and joyful wherever you are. I've never seen an armadillo in real life, Meems, so I'd probably be totally enchanted with one--for a little while, anyway. I'm like Lisa--it'll be months before anything blooms in my garden, so I really enjoy seeing what yours is doing. I enjoy your garden as usual. It is always so lush & full. Glad you caught that little destructive hole digger. I'm sure there are more around. The family you know. Hoping you will have a wonderful New Year. I think I saw an armadillo at the zoo once, but never in a garden (well I do live in Oz so that probably explains it!!!) Lovely looking garden! Hope you catch them all! I have heard how much damage armadillos can cause. Glad we don't have them here. You are smart to trap them and turn them loose far, far away. We have trouble with squirrels and chipmunks digging up our spring bulbs. Because we spray Liquid Fence, the deer leave us alone (thank goodness)... Sometimes, gardening is one step forward and two steps back, isn't it????? BUT--overall, your garden is gorgeous. The armadillo sounds like fun-but I don't have to worry about one eating my garden. Hope the New Year brings you much joy and happiness. I bet you and your husband felt good when you saw that little critter in the trap. I think it's great that you are able to catch and relocate the animals. I have to reckon with the iguanas in my yard. I get so frustrated when they eat the flowers. The plectranthrus is really gorgeous. I hope you're enjoying the refreshing weather as much as I am. Not only plants, but even pests are so exotic in Florida! Meems, I love the top picture! What a beautiful garden, even in winter! The Crinum Lily is wonderful, indeed! Have a Healthy and Happy New Year! Catch them while you can! I spied my first armadillo at a campsite in OK in the middle of the night. I shined the flashlight everywhere looking for deer, then shined lower and saw the critter. Fighting deer here they have stripped away two camellia bushes in the past few nights. The tomato cages are getting a second use this year now. Meems, I thought for a minute that you were trapping the peafowl! LOL! Only because I wish someone would trap the one living in my wayback! We plant for critters but, don't count on big birds and prehistoric looking creatures that destroy our hard work. We just want happy bees, butterflies, birds and what ever else is NOT destructive! Your garden is wonderful to see. 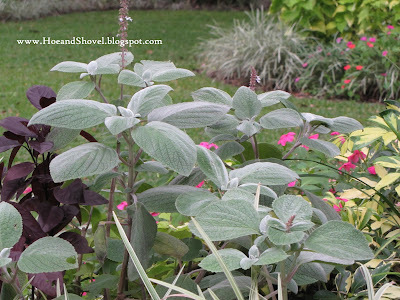 The plectranthus is gorgeous and please show the crinum lily as often as you want. I had a wonderful visit with my son and his gf, thank you for asking. I hope your holiday is going well. bravo mr.& mrs.meems...so glad you could catch this bothersome creature. if only it could be a due warning to the others that they are not welcomed. your crinum lily is magnificent. i love that it has darken, too. is that silver shield related to the persian shield? it is lovely with it's fuzzy quality. happy december gardening for you dear sis. It's a bit of a novelty pest really, but understand they can do some damage. Did you say they are they native? Here we have grey squirrels (non native) which are the worst pest. Urban red foxes cause a real mess. Both are very difficult to control. Another non native is the ring necked parakeet which I actually quite like to see! Best wishes for the New Year, and happy blogging in 2010! PS- The Crinum is to die for, just stunning. We have problems with armadillos, too. What bait do you put in your traps to entice them to enter? We have thought about trapping them like we do the possums and raccoons, but didn't know what bait to use. We trap, we do not relocate. Nobody around us wants any more armadillos, either, so we dispatch them. They are not native, having somehow crossed the Mississippi to run rampant here. One summer we stopped counting at 22 that we trapped. Yes, twenty-two! That's not a typo. They reputedly carry Hansen's disease, but I know of nobody who has contracted leprosy from an armadillo. Thank you all for your show of empathy with our armadillo damage control. We all have our nemesis in our gardens and like Gail said wouldn't it be nice if we could only count on the helpful creatures like the happy bees, butterflies, birds! 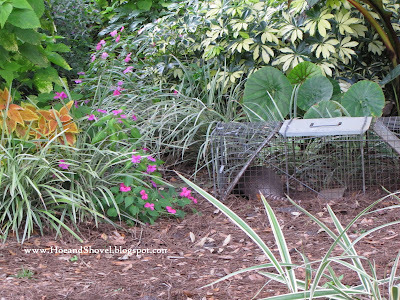 But the critters will always be looking for food and shelter in our well- nourished gardens. Which means the wildlife that doesn't realize they are trampling and damaging will have to be dealt with as well. I have to say I am very grateful we don't have to deal with deer, like Randy, Betsy, (and Gail on occasion) although we DID see one on the side of the road the moment we pulled over to relocate our armadillo. It ran immediately back into the woods where it will be safe AND have plenty to eat. To my northern friends You are dears for always stopping by and please come any time during this snowy season as we will do our best to keep you in the color of green reminding you of colorful seasons to come when I will be envious of the beautiful perennials blooming in your pretty gardens. Prue, I wish they were all contained in a zoo. :-) That would be ideal for the homeowner. Rob, the armadillos are not native ... not even to the U.S... came over on a ship (I think that's what Mr. Meems read about them). Were mostly in TX but have migrated their way throughout the southeast, U.S. Like you, I love the non-native Quaker parrots that have come here from the south. Jan, armadillos are quite blindly dumb~~~ foraging with their snouts nosing along in the dirt (of course they are removing my mulch as they create ditches and trenches along the way) and digging with their claws as they go. They will walk right into the cage without bait if it placed along their trail... thus the reason we move it around daily. When we did some research it was noted that you can hang some earthworms from the top of the cage placed in a mesh bag or some hosiery would work well. We opted to leave the cage empty and take our chances. Maybe the earthworms would 'up' our take but honestly I don't have the time to keep fresh worms in the cage. You go girl! Twenty-two! It feels like we must have at least that many around here when I look at the damage they do nightly. Post that Crinum as often as you like, it's magnificent & I sight for color-starved eyes. 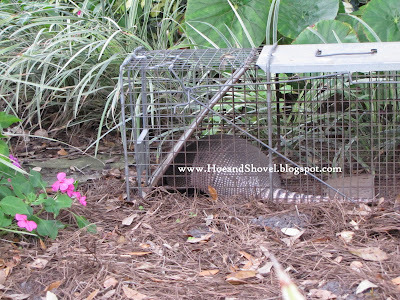 At least you can trap Armadillos, unlike deer, which are too big. Good luck getting rid of the varmints. Hi Meems, I really like the silver shield. It looks a little like a light frost across the leaves. None in our woods, just rats with fuzzy tails to dig up bulbs and rattle the dogs! Your Lily is spectacular. I only have the white ones. As usual, your photos are great, they make me feel like I am strolling along with you as you describe your garden. I do know what it is like to struggle with the uninvited critters. I have seen, Armadillos, Raccoons, Possoms and of course hundreds of squirrels in the garden. When I used to feed the birds, I became overrun with mice and rats also, going after the bird seed. I hated to, but I needed to stop putting out the bird food to eliminate them. Tastes like chicken. Your Crinum is a show-stopper. Late but a very Merry Christmas to all lat Hoe & shovel!! Happy New Year Meems! Well, I is filled wif' questions: does ya grow hybrid veggies or open pollinatin'? What is ya puttin' in your garden next? I mean fer early Spring? An' most curious of all, how much time a day is ya out in the lovely paradise ya created? I say it every time, but mercy, each visit over heah is a pure pleasure!